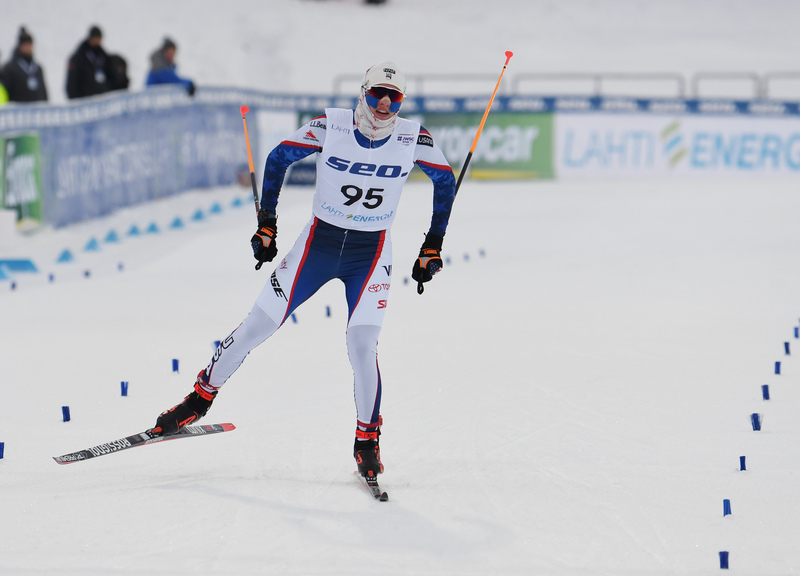 Gus Schumacher skiing to sixth place in the U20 10 k skate during the 2019 Junior Worlds in Lahti, Finland. (Photo: Doug Stephen). Tuesday in Lahti, Finland was as Finland should be: squeaky-snow-cold and cross-country ski racing on offer. Eighteen-year-old Gus Schumacher broke through for the U.S. and placed sixth overall in the U20 men’s 10-kilometer freestyle. Schumacher was the 95th starter of 102 finishers on the day. His sixth place finish was consistent with his 1.1k, 5k, and 6.6k splits where he was ranked 5th, 6th, and 7th respectively. Schumacher stopped the clock in 23:19.3 minutes, 44.4 seconds behind the winning mark. The Lahti championships are Schumacher’s second Junior Worlds. His sixth place is his best individual result. He was part of the second place 4 x 5 k U20 relay last year in Goms, Switzerland. Schumacher extracted what he needed from the videos. Imprinted in his mind before his 10 k start were enough visuals to quell the nerves and provide a path to fast clean skiing. Schumacher executed his plan. He dialed back the initial effort, stayed in control, and systematically revved the engine. His run at the podium came up just 17 seconds short. But with his plan executed, the Anchorage based skier had no regrets when reflecting on Tuesday’s race effort. “I definitely wanted to be top-10, but I felt like and still feel like a medal is in sight,” Schumacher said. At 18, he still has one more year of eligibility in the U20 ranks. France’s Jules Chappaz won the race in a time of 22:34.9 after skiing the fastest splits at 5 k and 6.1 k. Sunday’s classic sprint winner, Russia’s Alexander Terentev, placed second (+21.0), and Norway’s Iver Tildheim Andersen in third (+27.2). Canada placed two skiers in the top-31. Remi Drolet finished in 20th (+1:14), Samuel Gary Hendry 21st (+1:15.9), Thomas Stephen 31st (+1:36.8). Xavier McKeever skied to 44th (+2:04.6). For the U.S., Zanden McMullen placed 32nd (+1:40.6), Johnny Hagenbuch 34th (+1:46.3), and Noel Keeffe 58th (+2:45.7). Sweden’s Frida Karlsson won the U20 5 k skate in 12:50.6 minutes. Norway’s Helene Marie Fossesholm placed second 11 seconds back, with Finland’s Anita Korva in third (+19.8). “It was fun to ski today. I just wanted to have my revenge”, Karlsson told race organizers after the race. 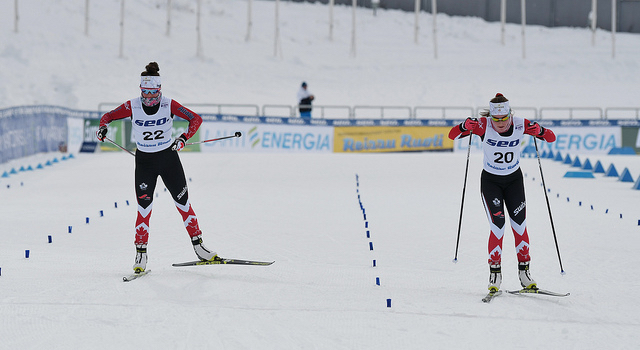 Karlsson had qualified first on Sunday’s U20 classic sprint but placed fifth in the overall. 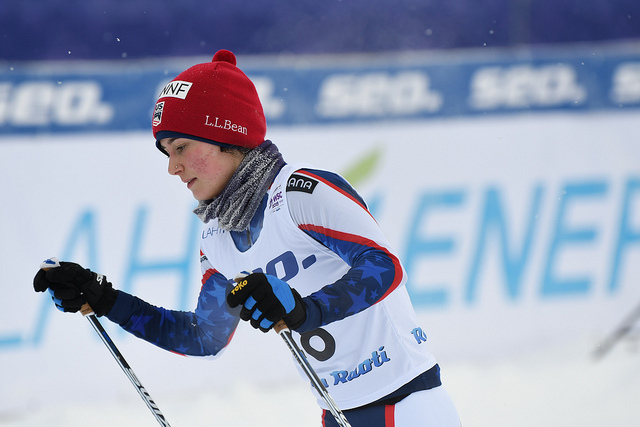 The best placed North American was U.S. skier Kendall Kramer who finished in 15th (+55.6) place. Also for the U.S., Sydney Palmer-Leger was 20th (+1:04.9), Novie McCabe 29th (+1:20.8), and Waverly Gebhardt 65th (+2:28.8). Anna Pryce was the top Canadian in 43rd (+1:36.5). Teammates Molly Miller skied to 50th (+1:52.9), Isobel Hendry 58th (+1:57.1), and Jasmine Drolet 67th (+2:35.7).